Key difference: Samsung Galaxy S Duos is a dual-SIM phone that was launched in September 2012. The phone comes with a 4-inch TFT capacitive touchscreen, with approximately 233 ppi density. The device comes with Samsung’s TouchWiz UI on Android 4.0.4 ICS. The Alcatel One Touch Idol is the official mobile partner for the movie Iron Man 3. It features a 4.7 inch IPS LCD capacitive touchscreen with 16 million colors. The display has a resolution of 540 x 960 pixels. The phone is powered by a Dual-core 1 GHz MediaTek MTK 6577+ and a 512 MB of RAM. Initially smartphones would come in two categories, the no-nonsense simple phone and the extravagant phone with loads of features and a high price tag. However, now there are many people who expect different things from their phone, including features but a lesser price tag, durability, more battery power, etc. This has enabled smartphone manufacturers to offer an array of different phones for the different types of customers. Samsung announced the Galaxy S Duos as an option aimed for people that require double SIM capability, eliminating the need for carrying two separate phones. The phone was launched in September 2012. 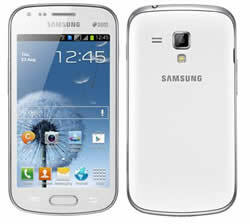 At first glance, the Samsung Galaxy S Duos bears heavy resemblance to the company’s flagship phone, the Samsung Galaxy S3. However, looking past the basic form of the phone and picking it up; the user can realize the reason for such a small price tag. The phone is a cheaper version of its big brother, with a lesser quality plastic and some downgraded features. However, let’s not label it as of yet, as it does come with some good specs. The 4-inch TFT capacitive touchscreen, with approximately 233 ppi density, is pretty decent with good contrast and colors but it is too reflective under sunlight, making it a bit difficult to use outdoors without squinting or trying to cover the screen. The phone itself is easy to hold and handle, making it sleek and small enough to slip into jeans pockets or a small purse when on the go. The 120 grams of weight also ensures that the phone does put that much pressure on the hands when holding the device for longer periods of time. The top of the device houses only the 3.55 mm jack, while the bottom only has the USB/charging port. The right side of the device holds the power button on the top right hand and the microSD card slot. The left side of the device only holds the volume rocker, a bit hard to reach, if a person is used to having it on the right. On the front, the device has the home button that is surrounded by capacitive more options and a back button. The device comes with Samsung’s TouchWiz UI on Android 4.0.4 ICS. Again, the UI is a toned down version of the one found on the S3. The device lacks the ripples effect and the water-drop sound and has four customizable shortcut buttons on the bottom of the lockscreen that can directly take you to apps such as missed phone calls when unlocking the device. The device allows users to add/remove apps from the homescreen as well as add/remove panels similar to other versions of Android. The device is powered by a 1 GHz Cortex-A5, with about 786 MB of RAM. The RAM is a slight upgrade to the 512 MB available on other phones, but it still isn’t that great when trying to run dual-SIM, resulting in some lagging during operation. The dual-SIM capability and standby allows both SIMs to be operational at the same time. The device comes with a 5 MP rear camera for taking photos and recording videos. The rear camera is pretty decent in terms of taking photos. The images have pleasing colors and a good dynamic range, but the photos are a bit grainy. The phone also comes with features such as smile detection, geo-tagging, Share shot, effects and panorama mode. The S Duos also houses a VGA (0.3 MP) front camera that is as okay, nothing much to talk about. The phone can also capture videos in VGA resolution at 30fps. The S Duos comes with a decent removable LI-Ion 1500 mAh battery, that according to the company provides a talk time of 770 minutes in 2G and 520 minutes in 3G, along with a standby time of 570 hours in 2G and 470 hours in 3G. The phone does not come with the same amount of features as available in Galaxy S3, but with the price tag of this device, it is still something. The main reason for purchasing the phone would still be the dual-SIM capability, while in other countries where dual-SIM options are more common, the phone may not fare as well.